The basic cause of the dispute was the refusal of a consortium of Dublin businessmen, led by William Martin Murphy, to recognize the right of workers to join the Irish Transport and General Workers’ Union. The ITGWU, led by James Larkin, in response to sackings of their members, called a strike on Murphy’s United Tramway Company in August 1913. What made the dispute much bigger than either that company or the Transport Union was Murphy’s response. He organized all but a handful of Dublin’s major employers not only to sack all ITGWU members, but to force their employees to sign a pledge never to join the union. Those who refused to sign were sacked or “locked out”. Eventually the numbers on strike reached 20,000. Dublin experienced rioting, beatings and even shootings in the streets. 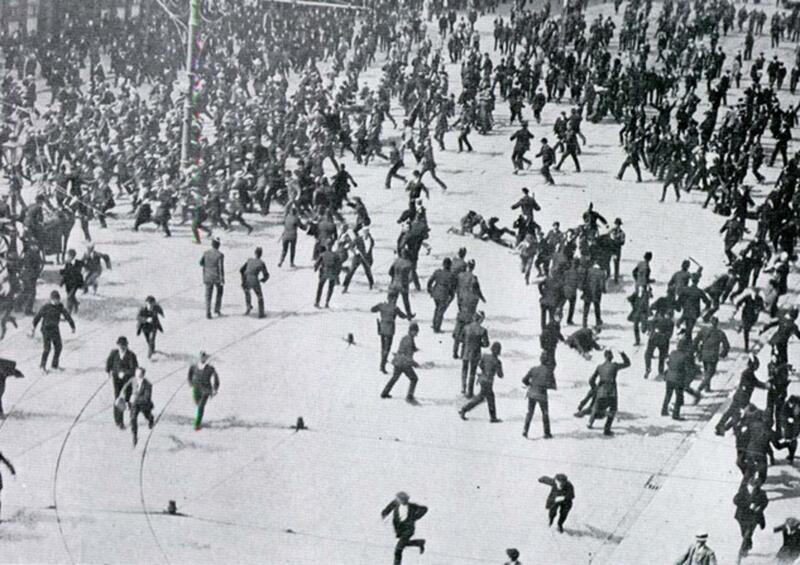 On August 31, the Dublin metropolitan Police charged a rally on O’Connell street, injuring hundreds – an event known in the Irish Labour tradition as “Bloody Sunday”. Two strikers died from injuries inflicted by the police during apps that, another died from a gunshot wound and at least one strike breaker was beaten to death by strikers. One of the most controversial elements of the lockout was the so-called “Kiddies’ Scheme”, the brainchild of English socialist Dora Montefiore. Under this scheme, the children of strikers would be looked after in England by other trade unionists until the dispute was over. Under the scheme, strikers children would be looked after in England. It aroused the intense hostility of the Catholic Church. The idea aroused the intense hostility of the Catholic Church – which was engaged in a proselytizing ‘war’ with Protestant Churches in Dublin. It was concerned that Catholic children would be ‘corrupted’ by atheist or Protestant households. William Walsh, Archbishop of Dublin also feared that the children would not be able to return to the slums after living in more prosperous surroundings. One legacy of the Lockout was the Irish Citizen Army. Originally this was a street-fighting force intended to take on the police with fists and bats and to protect union demonstrations. But just three years later, mostly on the initiative of James Connolly, it participated, armed, in the nationalist insurrection, the Easter Rising. The paradox here is that William Martin Murphy was an Irish nationalist, who had represented Dublin as an MP for the Irish Parliamentary Party, while the workers’ principle source of support in 1913 came from British trade unionists. The battle to try to reverse these sackings took six long and bitter months and ultimately ended in failure. By early 1914, hunger and the withdrawal of funds by the British Trades Union Congress (TUC) meant that the workers were forced to give in and sign the employers’ pledge. Though many never recovered their jobs at all. Historian Padraig Yeates sums up what he feels is the historical importance of the Lockout. Coming from a socialist and secular perspective, he argues that the Lockout represented the defeat of progressive and pluralist ideas, on the eve of Irish independence, by the forces of business, the Catholic Church and conservative nationalism. The kiddies scheme was also supported by Sylvia Pankhurst and the East London Federation of Suffragettes, and the scheme was inspired by the successful evacuation of children during the Lawrence Textile strike in 1912, that was supported by the IWW. Connolly had been a member when he was in America and Larkin would join it later when he moved to the States. And to expand on the Citizen Army section. It wasn't just Murphy who was a nationalist, at this time many large employers in Ireland had some connection to an Nationalist organisation of some kind. Usually a respectable one like the Irish Parliamentary Party but it wasn't unknown for the more radical Greens to have a few wealthy benefactors. The Citizens Army itself had the support of the Countess Markievicz who used her husbands fortune made largely though some estates in the Ukraine and Poland to kit them out in proper military equipment. There was a bit of a split when Connolly took the ICA into a formal alliance with the other Nationalist militias because most of them were supported by the very bosses who took part in the Lockout.